Home Articles DMV News Get REAL: How Much Longer Will Your Driver’s License or State ID be Accepted at Airports? Get REAL: How Much Longer Will Your Driver’s License or State ID be Accepted at Airports? After nearly 14 years of feet dragging, hand wringing, and head scratching, it looks like the U.S. is finally ready to keep it REAL—at least when it comes to personal identification cards. The countrywide implementation of the REAL ID Act seems right on track after more than a decade of confusion and delays—and with an important deadline for compliance quickly approaching, the progress couldn’t have come at a better time. The REAL ID Act, which was first adopted in 2005, calls for the official upgrade of all state licenses and IDs, referred to as REAL Identification cards. Starting in October 2020, residents won’t be able to board domestic flights without them. Though the law officially went into effect on January 22, 2018, that deadline was essentially only for states and U.S. territories: It’s the point at which state agencies were required to have the internal infrastructure in place to start creating the ID cards.The enhanced documentation will also be needed to enter military bases, nuclear power plants, and most federal buildings by that date. *NOTE: The Department’s website has not been updated during the recent government shutdown. For the most up-to-date information regarding REAL ID deadlines, contact your state Department of Motor Vehicles or Department of Transportation office. Most likely, very little—for now. Even if your state wasn’t able to nail things down by last January, residents of areas that were granted a federal extension to comply with the law will still be able to use their regular licenses to gain access to flights. Which means residents of every U.S. state and territory will be able to use their current license or ID until October 1, 2020. From that date on, a citizen or territory resident must present a REAL ID to board any flight or enter the aforementioned federal facilities. During this “card-based enforcement” period, the government will also accept several other forms of identification, including U.S. passports and permanent resident cards. Enhanced driver’s licenses issued in the border states of Michigan, Minnesota, New York, Vermont, and Washington State will also be acceptable. See the full list of acceptable REAL ID alternatives here. What’s a REAL ID Anyway? The REAL ID Act passed in 2005 in an effort to combat terrorism. Resident’s files and information will be electronically shareable from state to state, and the new IDs are harder to forge. Originally imagined in the wake of 9/11, the main goal of the REAL ID Act is to help fight terrorism by limiting access to the federal facilities and tightening security on domestic flights before passengers even reach the gate. It achieves that by calling for a stricter—and supposedly more secure—process for creating the ID cards. States will require more proof of residency, immigration status, and Social Security numbers for any applicants looking to receive the identification, and the cards will be made using advanced technological techniques, making them harder to forge. But the REAL ID Act will also create a national ID database of sorts, calling for states to not only keep the additional paperwork provided by applicants—including everything from visas to birth certificates to Social Security cards—on electronic file, but make those files sharable with all other states. It was this second aspect of the law that some states sought to challenge, keeping so many in legal limbo for so long. Some officials openly worried that such a system could be easily corruptible and leave hundreds of millions of residents vulnerable to cyberattacks. Still, all 50 came around in the end, able to either meet the government’s deadline or secure an extension. 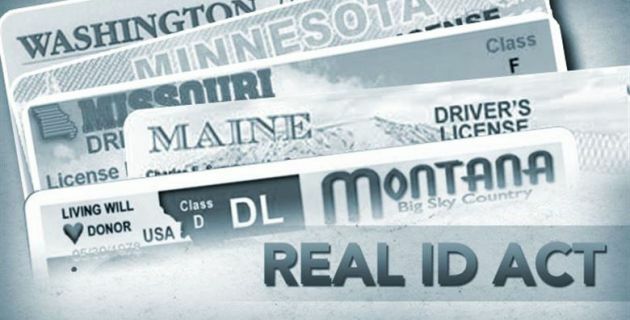 Which States are REAL ID Compliant? As of October 2018*, a total of 37 states and territories plus the District of Colombia have been designated “compliant” with the law, meaning their internal operations are good to go for creating the specialized ID cards. The remainder of the states and territories have been granted extensions. Again, these dates have nothing to do with when airports and federal facilities will start requiring REAL IDs for access. The only date residents of any state or territory need to worry about having a REAL ID is October 1, 2020. Extension dates below are the point by which states must be deemed compliant with the REAL ID Act. American Samoa: October 10, 2019. New Jersey: October 10, 2019. Northern Marianas: June 1, 2019. Rhode Island: May 1, 2019. U.S. Virgin Islands: April 1, 2019.